New Delhi: The Lok Sabha on Monday passed the Interim Budget with voice vote amid a walkout by the Congress and the Left parties. The Lower House of the Parliament also passed the Appropriation (Vote on Account) Bill 2019 and the Appropriation Bill 2019. 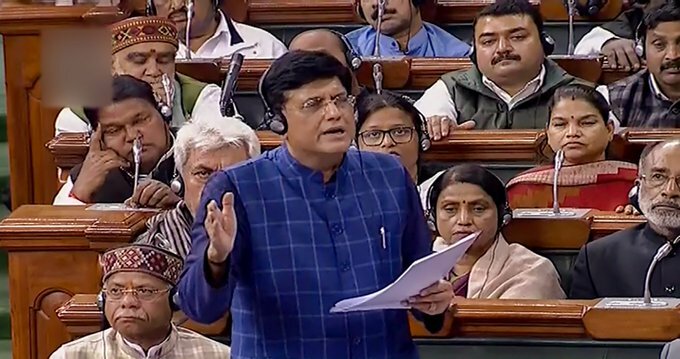 Finance Minister Piyush Goyal introduced the Appropriation Bill and the Finance Bill today amid protests by opposition members in the house by a voice vote. The Bills were passed by voice vote after the Finance Minister’s reply. “The country is going on the path of development ever since Narendra Modi came to power,” he added. Highlighting the economic achievements, the Minister said, the NDA government has brought down the fiscal deficit to 3.4 percent. Participating in the debate, BJD MP Bhartruhari Mahtab said the reports on black money that the government has, should be shared with other Members. He also asked if the government would consider the 90-10 allocation of the government grant for regions with a larger concentration of SC/ST citizens. Congress MP M. Veerappa Moily said that the budget allocation for defence sector is less as compared to last year’s budget. He said, because of demonetization, the industrial output and MSME sector suffered a loss and the GDP rate also declined.